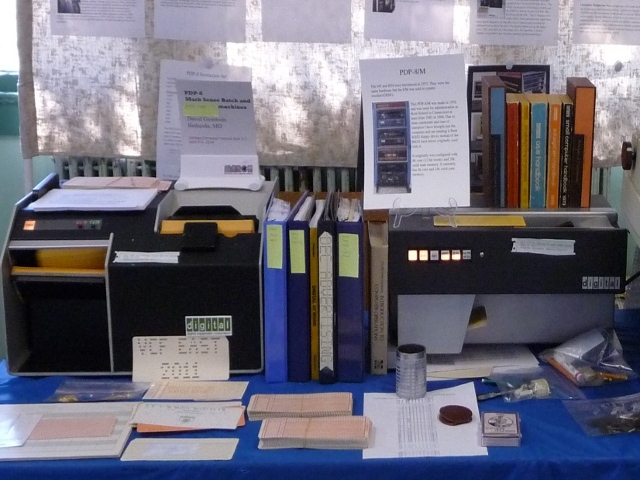 The retro computer hobbyist group MARCH (now VCF) hosted the Vintage Computer Festival East 2014 exhibit. I brought a PDP-8/M Computer, Wrightline hand card punch, LA100 printer, CR05 card reader, CR8F card reader, and VT100 terminal for my exhibit. I was also supposed to have a RX02 floppy drive for running the system but it got left at home. I instead used OS/8 Disk Server. 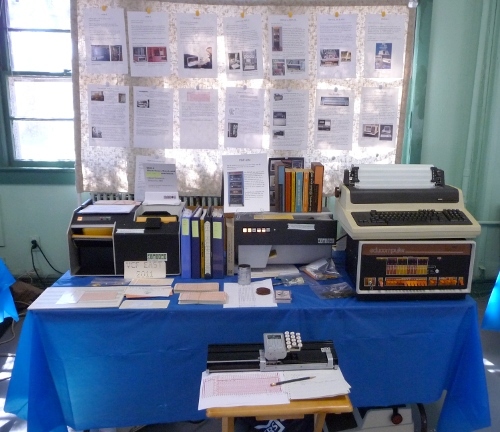 This exhibit showed punched card equipment that was used with PDP-8's and some general punched card information. Both readers I brought could read normal punched cards. The CR05 could also read mark sense cards which are marked with pencil instead of having holes punched in them. The CR8/E punched card interface for the PDP-8/E only supports reading cards. DEC offered mark sense batch for the PDP-8 which allowed a large number of students to share one computer by preparing cards without needing anything other than the special mark sense cards and a pencil. 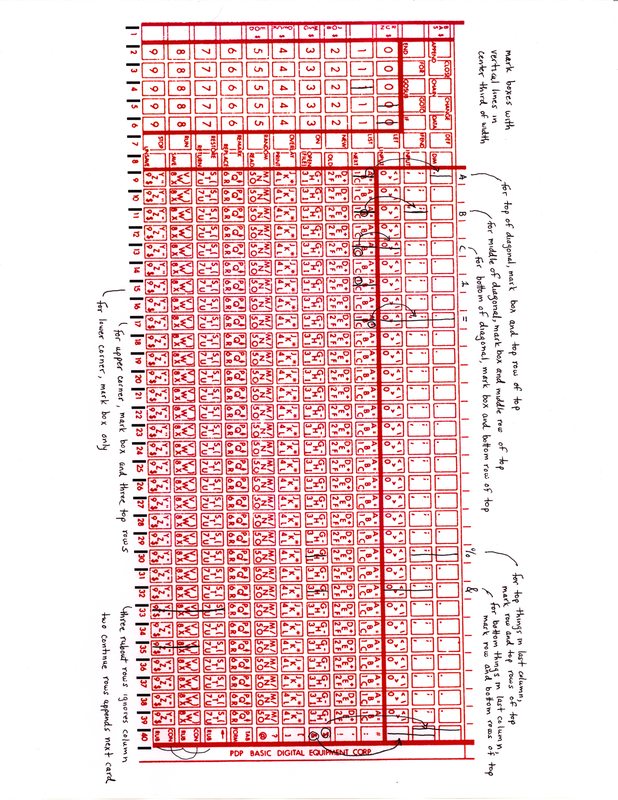 I had used my laser printer to print on blank punch cards the special card format needed. Visitors could try writing BASIC or FORTRAN programs and running them. I had a couple people do simple BASIC programs and one do a simple FORTRAN program. Mark sense cards could also be used for attendance. 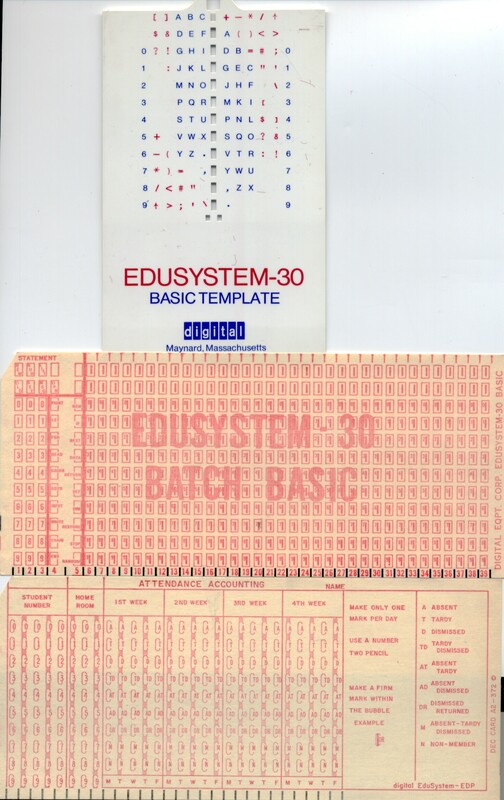 DEC also had standalone EDUsystem 30 BASIC which used a different format mark sense card than the mark sense batch BASIC. See the attendance card, and EDUsystem-30 template and basic card. I also had a hand card punch which people could try punching a card and then I would run it through the reader. I gave them the card and a printout in block letters of what they punched on the card. I had a number of people try punching a card. These people take better pictures than me. You may need to click twice on the right side buttons to start the video.